English cottage on the hill. This storybook cottage has always been one of my favorite houses in Atlanta. It sits high on a hill nestled into a charming neighborhood. The front garden overlooks a beautiful pond surrounded by a park that is the home to beautiful ducks and swans—perfection. I think I might have a house problem—maybe it’s better described as a house addiction! The house was built in 1915 and is one of the older homes in the neighborhood. I think it was formerly renovated by Atlanta architect Norman Atkins who added the addition to the home. The new owner has hired Shon Parker of Shon Parker Designs to design and decorate the home. The rooms have been lightened and the floors darkened. The walnut paneled entry gives the feel of being in an English library. Mr. Parker has filled the home with velvets, linen and silk creating instant warmth and charm. 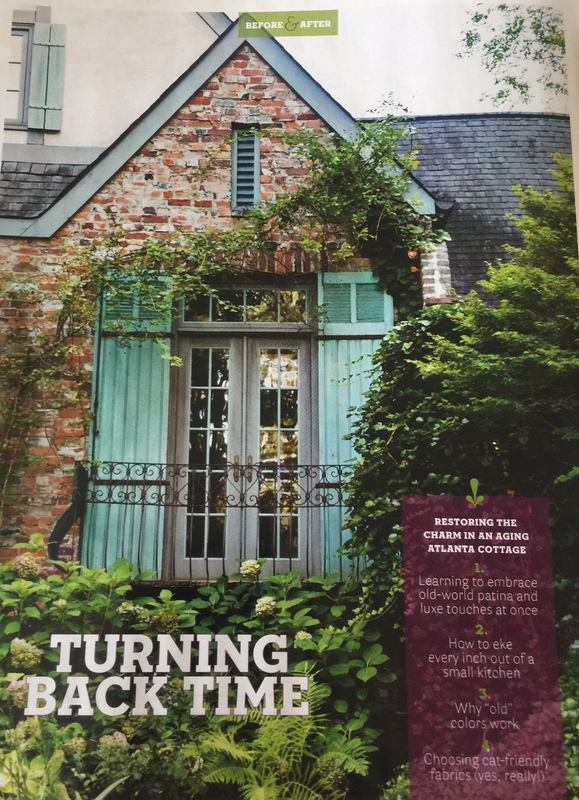 The home is featured in this month’s House Beautiful under the title ‘Turning Back Time.’ Click on over to the link below in House Beautiful for a look at the interior renovation and decor. I love the front entry with the charming gate. This front garden and patio overlooks the park and pond. This gate leads to the front garden. The front view of the park and pond—yes, please. Have a look inside the home with the link to ‘Turning Back Time‘ in the February issue of House Beautiful below. Also I have added to my Pinterest page. I am so sorry that I was not able to speak with you about this post. Randy and I worked closely with Brian Smith to design the addition. Many of the architectural additions, balcony, shutters, interior doors and wainscoting etc. were purchased when we went to France. Paula, So great to hear from you! I have always loved your home in Atlanta. You and Randy did a great job on the renovation.